I’m not sure how much you’ve followed Global Lives this year, as our inboxes and newsfeeds have been deluged with so much political tumult. As we close the chapter on a crazy 2016, I want to share a quick recap on what we accomplished with the generous support of our donors and why I am so optimistic for the future of Global Lives. – The New York Film Festival at Lincoln Center hosted the premiere of Lives in Transit, our new exhibit featuring 24 hours in the lives of transit workers from Vietnam, Nepal, Turkey, China, India, South Korea, Colombia, Spain and Canada. More than 500 volunteer translators contributed to the production, post-production and translation of Lives in Transit. Our packed house at the Lincoln Center opening—the exhibit drew an estimated 10,000 visitors. 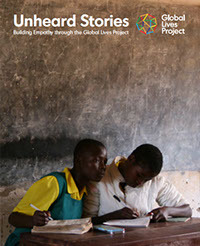 – Our Unheard Stories curriculum—developed at Stanford—reached hundreds more educators and thousands of students around the world. The curriculum is now available on Amazon.com. – Google and Adobe assembled pro bono teams of a total of more than 50 employee volunteers to contribute their expertise in web development, video editing, analytics and more. Among other achievements, this increased our website traffic by 150%. We’re on track to reach 150,000+ unique visitors in 2017. – Google‘s offices in Mountain View and New York hosted Global Lives exhibits and events for employees and guests. Bose donated headphones which now travel with our two exhibits. – UC Berkeley and a to-be-announced venue in Cambridge, Massachusetts will host the West Coast and New England premieres of the Lives in Transit exhibit in 2017. We’re lining up additional venues at museums, film festivals and schools now, and your financial support will help us secure broad distribution in physical exhibits and online. On a personal note, my wife and I had twins in July! Many of my friends have called Global Lives my ‘baby’ or ‘brainchild’ over the years. I have to say that the meaning of those metaphors rang true in new ways this year. I’ve been incredibly lucky to have so many dedicated collaborators in the Global Lives Board and Collective that have stepped in to provide what I think of as “childcare” for the now pre-teen Global Lives (turned 12 in November!) as I shifted my focus to my growing biological family. In other news, I was appointed this year as Chancellor’s Public Scholar at UC Berkeley. I taught courses on “Social Media and Social Movements” and “Civic Technology” to undergrads through the Center for Social Sector Leadership at the Haas School of Business. Global Lives was a case study in both courses. I’m on paternity leave now from Institute for the Future, but plan to return to my research there on the future of philanthropy and governance in 2017. The past 12 years with Global Lives have been a wild ride. As my life changes, I remain more committed than ever to our mission to increase empathy across peoples, in the face of bigotry, racism and hate that fester today like a global virus. I look forward to continuing it with your support in 2017—please donate now and keep this incredible collaboration going strong! P.S. Did I mention that your donation is needed now more than ever? Running a nonprofit is expensive, the rent on our tiny office and our insurance costs just went up, and we’re hoping to hire a full-time staff member in 2017 as we did when we released our last series in 2010. Everything we accomplished above was done with only a fraction of my time (I was our sole employee in 2016 and most of 2015) and thousands of hours of volunteer support. My commitment to Global Lives has not waned, but I’m planning to transition out of my employee role to a donor (like you!) and board member in 2017, and this makes our financial stability all the more critical. Help Global Lives grow up today! My first logo wall shot—never thought I’d be proud of that, but I guess people change. Taken during my 35-hour trip to New York for NYFF in October. Didn’t have time to shave. Sorry.